"Heckmeck am Bratwurmeck" (Pickomino) is a cult dice game for shrewd fowls that have smelled the “barbeque worm”. Roasted worms are a bird’s delight. On one hand this is due to the fact that worms are the favourite dish of all poultry. On the other hand, the preference for barbecue worms is nobody else’s doing but of Johnny Rooster Roaster. His Uncle Sam, a native from Chickentown Kentucky, had the idea to open up a worm roasting house at each corner of town. Johnny didn’t hesitate to make this idea a reality and since their first days as worm-barbecue masters their roasting joints have found no lack of eager and famished customers. And the customers keep coming. All over the place, chicken folk have started to gather worms and supply them to Johnny. Whether Curry Worm, Roast’n Worm or Frankfurter Worm: poultry of all sorts are standing in line to taste one of these specialties. For Johnny and his new found business the following stands: from worm hunter to millionaire! Get the most worms of all players to win this game. You are one of the few chickens fighting over a nice meal of worms. each tile has 2 values,the first is a number and the second is the number of worms. Players roll a handful of six sided dice which has faces from 1 till 5 and a worm. The worm is also counted as 5, but players are required to roll a worm before they may pick one. Each time players roll their die, they need to select a certain result and keep all dice with that result. The rest of the dice are rolled the players can’t make unique sets anymore or decide to stop. or on top of your opponent’s stack of worms. even if this means taking it away from the top of another player’s stack. he needs to add the worm on top of his stack back into the field. Would that worm be of lower value, the worm with the highest value shall escape. The tile with the highest number will be flipped face down is counted out of the game, which helps progressing the game. and the one with the most worms wins. This game exists of a pile of sturdy and hard plastic tiles and some wooden dice. The overall quality is very nice. it is very fun and challenging to play together. If I saw this game at a shop I’d probably ignore it. It seems to be aimed at children, the art is very cartoony and the theme is chicken on a worm barbecue. Boy, am I glad a friend invited me to play! Beneath its childish appearance lies a dice game with player interaction and interesting choices. Finally a dice game where you don’t just pick up the highest numbers and re-roll the rest. If you’re playing with competitive people it can be really intense and fun! I play this regularly during the lunch break. 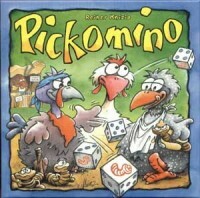 Add a Review for "Pickomino"